According to Hindu scriptures, the glory gods and demi gods exists due to Aaditya or Surya dev. Even the trinity of Brahma, Vishnu and Shiva rever the sun god. All the energy that drives this solar system comes from Sun, it is because of th Sun that it rains and grains are grown, which people eat to survive. Today, we tell you 12 auspicious and lucky names of Lord Surya, which if chanted early morning, will unlock good fortunes for you. As per Bhavishyapuran, without Sun’s powers, the whole world will be destroyed. The reiligious text also mentions 12 names of Surya dev along with the corresponding mantras. Chant them early morning around sunrise and see the miraculous effects it has on your mind and body! 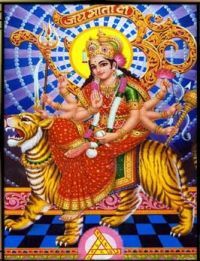 Longevity & Success Chants By : Dr.R.Thiagarajan Ratha Saptami is one of the most important Hindu festivals that is observed on the ‘saptami’ (7th day) during the Shukla Paksha (the bright fortnight of moon) of the month of ‘Magha’ in the Hindu calendar. In the Gregorian calendar, this date falls somewhere between the months of mid-January to February. Ratha Saptami normally falls on the second day following the celebrations of Shri Panchami or Vasant Panchami. This festival is devoted to Sun God and is also popularly known as ‘Surya Jayanti’, ‘Magh Jayanti’ or ‘Magha Saptami’. Lord Surya is known to be an avatar of Lord Vishnu. This day celebrates the birth anniversary of Surya Bhagwan and is believed that on this day Sun God enlightened the whole world. The word ‘ratha’ means ‘chariot’ and on the day of Magh Shukla Paksha Saptami, Lord Sun is worshipped sitting on His golden chariot that is driven by seven white horses. The glory of Lord Sun, His Chariot and Ratha Saptami is not just limited to this but is extended far more. In India, there are many temples built in honour of Lord Sun and special events and celebrations are held on the day of Ratha Saptami in all these temples. The festivities are very well-known in the Tirumala Tirupati Balaji Temple with special puja arrangements. Ratha Saptami holds special significance in the Indian states of Maharashtra, Tamil Nadu, Karnataka and Andhra Pradesh. Surya ,is a Sanskrit word that means the Sun. Synonyms of Surya in ancient Indian literature include Aditya, Arka, Bhānu, Savitru, Pushana, Ravi, Mārtanda, Mitra and Vivasvāna. Surya also connotes the solar deity in Hinduism, particularly in the Saura tradition found in states such as Rajasthan, Gujarat, Madhya Pradesh, Bihar, Uttar Pradesh, Jharkhand and Odisha. 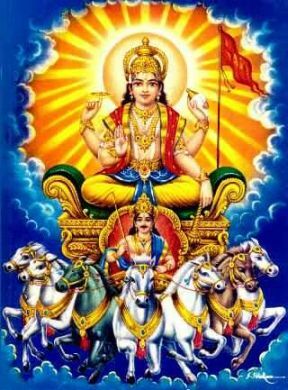 Surya is one of the five deities considered as equivalent aspects and means to realizing Brahman in the Smarta Tradition. Surya's iconography is often depicted riding a chariot harnessed by horses, often seven in number which represent the seven colour rays of the rainbow. In medieval Hinduism, Surya is also an epithet for the major Hindu gods Shiva, Brahma and Vishnu. In some ancient texts and arts, Surya is presented syncretically with Indra, Ganesha or others. Surya as a deity is also found in the arts and literature of Buddhism and Jainism.